Just because the regular season is over doesn’t mean high school football has stopped. Players and fans alike will have the opportunity to check out the best in high school football. 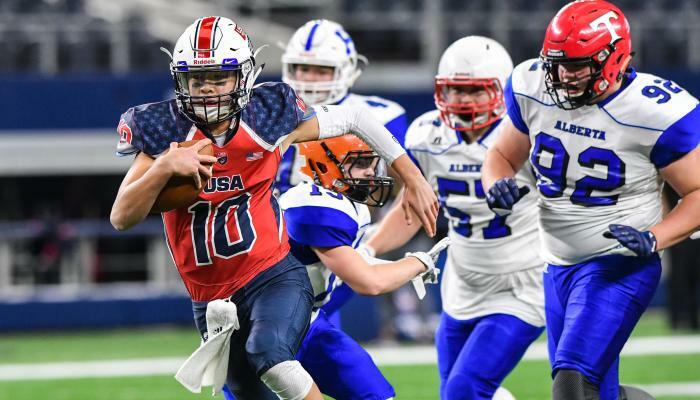 USA Football, the governing body for American football, will be hosting its ninth annual International Bowl from January 12 to 19 right here in Arlington at the Dallas Cowboys Stadium! The three-day event will consist of games played by the most talented players in the country. These athletes are not only outstanding performers on the field, but also embody traits such as leadership, character and dedication to the sport. Many athletes who have competed in past International Bowls have gone on to play professionally including Todd Gurley (Los Angeles Rams), Tyrann Matheiu (Arizona Cardinals), and Jameis Winston (Tampa Bay Buccaneers). The 2018 teams are comprised of elite athletes that have gone through USA Football’s National Teams program. How were these players chosen to represent the nation? Here was their path to International Bowl IX. Players first attended a nationwide two-day training and competition event in their city. This is the only event in the nation that features current NCAA coaches and former NFL players and coaches who provide premier training and recruiting exposure. Athletes are selected from the Regionals to compete in a contact or non-contact style of play. Participants have the opportunity to train with current NCAA coaches and compete against top players from around the country. From here, players are selected to represent the U.S. and compete against other countries’ national teams. The 2018 competition will be played against multiple teams from Canada, Japan, Mexico, and the Nordic countries. Visit www.internationalbowl.com to see the team rosters and buy your tickets for International Bowl IX!